When did Harrods stop selling heroin? “Sweethearts and mothers” used to buy packets of H to send to their boys in the trenches, but a moral panic about opiate overuse by soldiers on the Western front, and while home on leave, prompted the British government to introduce drug control laws. The heroin (properly, at that time, Heroin; it was a brand name) was sold in the form of gel. The authorities blamed it in part for a decline in discipline in the trenches. Heroin was invented (or stolen from his staff) by Heinrich Dreser, a head chemist at the pharma giant Bayer, who also invented Aspirin (ditto). Heroin was registered as a trademark in 1898. Dreser was one of the most innovative medical chemists of his time. He was the first to test drugs on animals on an industrial scale. (Heroin was tested on sticklebacks, frog and rabbits; the tests did not, surprise surprise, reveal its addictive qualities). In 1897 one of Dreser’s staff came up with a reliable process for manufacturing ASA, the active ingredient of aspirin (which had been known about for a long time.) Dreser rejected it: “The product has no value,” he said. He claimed that his objection was that aspirin would have “an enfeebling action” on the heart; more likely, he did not want anything to distract from the launch of what he was sure was a much more important and lucrative wonder drug - heroin. In fact, diacetylmorphine had been invented in Britain in 1874, but Dreser was the first to spot its potential. Chemists everywhere were looking for a non-addictive alternative to morphine as a painkiller and a treatment for respiratory diseases. Two weeks after synthesising aspirin, Dreser’s underling, Hoffman, synthesised heroin. Following the animal tests, heroin was tested on Bayer employees, who loved it. It made them feel heroic, they said; hence the brand name. Dreser claimed it was 10 times more effective as a cough medicine than codeine, without all the nasty side-effects. It was a better painkiller than morphine. It was safe, and non-habit forming. Heroin’s most important application was not as a painkiller - but as a cough medicine, saving the lives of patients with tuberculosis and pneumonia, as well as asthma and bronchitis. The logo on the promotional samples sent to doctors around the world showed a lion and a globe. It took off everywhere, but especially in the US; in a land of morphine addiction, Heroin seemed a godsend. It was used in cough mixture, and sold as Heroin pastilles, Heroin cough drops and so on. Gradually, wishful thinking receded and the tide of opinion turned against Heroin; this didn't matter much to Bayer or to Dreser, who switched their attentions to Aspirin instead, and made a fortune out of that (Dreser claiming full credit for a drug he’d had little to do with in the early stages). 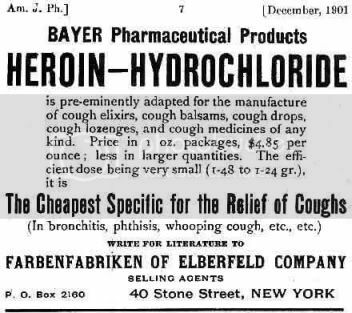 Bayer stooped making heroin in 1913; in 1914, its use without prescription was banned in the US. It is rumoured that Dreser (who was famous for taking an obese dachshund with him everywhere, even into the lab) was a heroin addict in his final years. His cause of death was listed as stroke; today, many doctors believe that a regular dose of aspirin can prevent strokes. 95% of the world’s legal, medical use of heroin today is in Britain. Opium was always more popular than heroin in Britain; and was superseded for most uses, and in public popularity as a wonder drug, by aspirin. In 1989, the typical morphine addict in US and UK was a middle-class woman in her forties; the typical heroin addict today is an 18-year-old male. A lovely festive little package wrapped up in ribbons being handed to a customer in a posh, old-time shop. ‘Inventing the Victorians’ by Matthew Sweet (Faber, 2001). I have to admit that was quite interesting. I didn't know that the term heroin was created based on people feeling like "heroes" but after reading this it makes perfect sense. I wasn't aware that heroin had been trademarked either. Information such as this is quite unique and would be of benefit for more people to know. The more information we have on origins, the more educated people can be about the world they live in. Heroin was marketed as a cough soother for babies in the 19th century IIRC. I never would have figured that there was so much history behind Heroin. I did find it a little weird that someone invented the heroin and its use. Do you think that if maybe we were less experimental when it came to wonder drugs about our health and stuck to natural cures that there would be less drugs in circulation? I think that there might be a good chance of it. I don't think that with the way our society is going that that will ever be a possibility. I will concede that there are many natural preventative measures we could take to make our lives better. However some "natural" methods cant treat aliments effectively. Most medicine are derived from finding the "active" agent in a natural source and bringing it out to make it more efficient. Technically, every chemical is "natural" Even the ones we create.